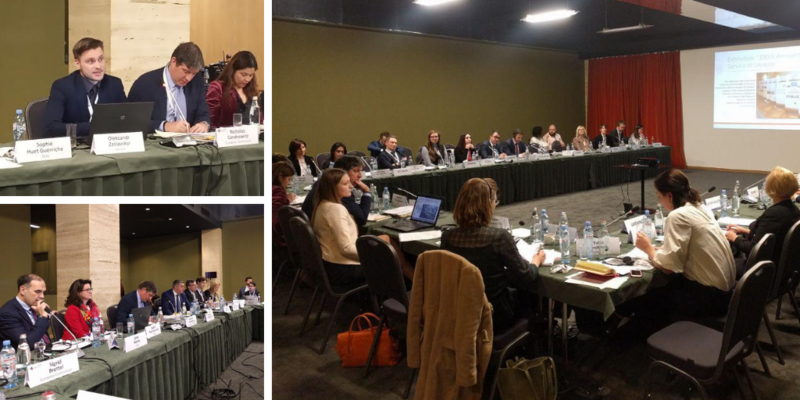 Between 2-3 April 2019, Eastern Partnership Civil Society Forum (EaP CSF) participated in 16th EaP Panel on Governance and Public Administration Reform (PAR) – organised under Platform 1, “Strengthening Institutions and Good Governance” in Tbilisi, Georgia. EaP CSF sent three representatives to the Panel – Oleksandr Zaslavskyi (Agency for Legislative Initiatives, Ukraine), Igor Zagrekov (Polotsk Center of Local Initiatives, Belarus) and Ketevan Kurtskhalia (WPRC – Women’s Political Resource Center, Georgia), providing the civil society perspective on discussed issues. The Panel opened with remarks from EU stakeholders – EEAS and DG NEAR, as well as government representatives from Georgia and partner countries. Among other topics, the Panel looked closely at Support for Improvement in Governance and Management initiative (SIGMA), started by EU and OECD (Organisation for Economic Co-operation and Development), training opportunities within civil service and devising strategies to increase the proportion of women in civil service. While there is some progress, Zagrekov pointed to disparities between EaP countries – the best figures come from Belarus where women represent 56% of the country’s civil service and occupy 49% of all senior positions. The same indicators are much lower for countries like Georgia or Moldova, even though the two states have now adopted a strategic approach in dealing with this issue. In their contributions, EaP CSF representatives drew on the findings of the recent EaP Index, officially presented in Brussels earlier this year. Closing the meeting, the organisers provided ample time for country reports – and challenges in assessing the impact of civil service reform and reaching 2020 targets. As shown in the case of Ukraine, the Association Agreement and strategy on Public Administration reform provided impetus for change in other areas, “spilling” over to healthcare, law enforcement and other executive bodies under the Ministry of Interior, said Zaslavskyy. In any case, “the impact of Public Administration reform should be identified and measured by fundamental changes in perception – both in, and outside state institutions”, he argued. The success of Public Administration reform relies on clear communication and finding ways of explaining the outcome to citizens – the final beneficiaries, concluded the Panel.